Ralf Marzen, founder and director of Mudita School of Thai Yoga Massage, is one of the most renowned and respected teachers of Thai yoga massage in the West. Ralf has been involved in Eastern healing arts and spiritual traditions since the early 90s. Ralf studied Thai Yoga Massage with the late Asokananda who was a true master and pioneer in his field. He became one of Asokananda’s main co-teachers. He also studied with Thai masters Chaiyuth Pryasith and Pichet Boonthumme. Ralf holds a degree in clinical psychology. He is also trained in Somatic Experiencing (SE) and NARM. His large theoretical and practical background in both Eastern and Western psychology and philosophy allows him to draw from many different sources in his work. Ralf is a Senior Teacher with the Sunshine Network. He is also an accredited instructor with Thai Healing Alliance International (THAI). He has worked as a head instructor and teacher trainer at the Sunshine Massage School in Chiang Mai, Thailand. Ralf’s work has been featured in The Sunday Telegraph, The Guardian, The Daily Mail, Health and Fitness and OM Magazine. Besides Mudita School of Thai Yoga Massage he also runs StillPoint Centre for WellBeing in Central London. In his teaching Ralf brings together his passion for meditation, yoga and Thai Yoga Massage as expressions of the one Source in all of us, creating a safe, supportive and encouraging space for participants to learn and grow. He is well known for his precise but relaxed and compassionate teaching style. Dézi is a co-teacher on our courses in London and Thailand, and shares her infectious passion for yoga and Thai yoga massage. She brings a wonderful mix of warmth, kindness and humour to our groups. Dézi found Thai Yoga massage in 2012, completing her training with Ralf in London and Thailand. Thai Yoga massage has become a part of her life since and she has been sharing her passion for it on the London courses and on the retreats in Thailand. For her Thai Yoga massage is a moving meditation, a dance, where the giver and receiver equally benefit from the exchange of the treatment. Dézi has been teaching yoga, Pilates and meditation and is based in London. Dézi is a lifelong student and loves to share her passion with others. Her aim is to make this world a better place by adding positivity, caring, compassion and enthusiasm towards life. Dave assists on our courses in London and in Thailand. Dave began his journey back in 2001 with Kira Balaskas, being drawn to Thai Yoga Massage from his passions for tai chi and yoga. During that time he was also immersed in 5 years of Waldorf Movement Studies and taught in a Steiner School as a movement and PE teacher for many years. He is also a qualified yoga teacher and focuses on teaching restorative yoga, which shares so many aspects of Thai Yoga Massage. For the last 7 years he has been working full time as a Thai Yoga Massage therapist in Matlock, Derbyshire. Over the years, he has been privileged to study with many great teachers, including Asokonanda, Pichet Boonthumme, Ralf Marzen, David Lutt and Kam Thye Chow. Dave shares the philosophy of his great friend and mentor, Ralf Marzen, that the beauty and effectiveness of healing touch lie within the detail of technique and mindfulness of oneself. Dave loves to bring a playful element, wherever possible and beyond all things, to share his passions in life. 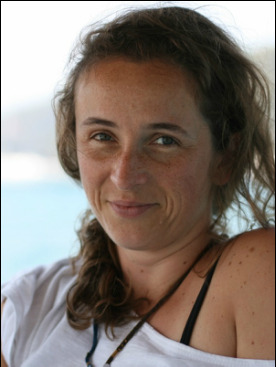 Katrin Heuser is one of our co-teachers on the Thailand retreat. Working with the body and movement has always been a significant part of her life. Starting with ballet from the age of six, she continued to dance in one form or another﻿ for 24 years. In her early 20's she took up Pilates to help with her scoliosis, which eventually led her to yoga and she trained as a yoga teacher with the British Wheel of Yoga. Katrin's approach to health and well-being is rooted in bodywork. 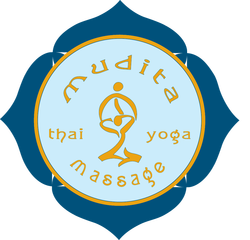 To deepen her practice, she trained with Mudita School of Thai Yoga Massage. This holistic practice has since become a main focus of her work and she continues to deepen her experience not only from her practice but also studying with other teachers around the world. She is also a qualified Manual Lymph Drainage therapist. Katrin now lives in Lisbon, where she has a small yoga studio and offers training courses in Thai Yoga Massage. Her latest project is to bring yoga to the rooftop terraces of Lisbon, from which you can enjoy the most incredible views of the city. Our team runs training courses and workshops all over the UK, Europe and Thailand.